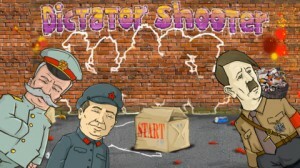 DictatorShooter is an iPhone game developed by Snowfox BV. In this fast-paced shooter, you need to take down some real villains: history’s most infamous dictators. Dictators are trying to take over the world, and you’re our last line of defense. Travel the globe to kill off these bad men, visiting Africa, Asia, and Europe to accomplish your ultimate goal. 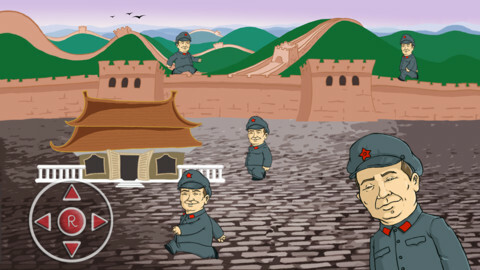 Some of the infamous dictators featured in this game include Adolf Hitler, Joseph Stalin, and Saddam Hussein. No photographic likenesses are used, just line drawings. However, because of the cartoony way that some of these dictators have been drawn, it can be hard to recognize them immediately. Compounding this issue is the fact that when you go to the “Levels” screen, you can see all of the dictators…but they don’t have names underneath them. I think many casual players know the names of history’s most infamous dictators…but not all people can recognize them on sight. While the graphics are simple, the targeting controls feel a little loose at times. The controls are responsive enough, but targeting sometimes feels a little like sliding a puck across the ice. I wish the virtual control for targeting was a bit smaller as well: when characters run behind your left thumb, it feels a little bit like your entire field of vision is being blocked. This game might fare better on the iPad than the iPhone for that very reason. However, the game itself is massively enjoyable. DictatorShooter earns a final Tapscape score of 8 out of 10. If you want to make a statement about politics, this shooting game certainly sends a message. Why kill generic enemies when you could be killing real life bad guys? This fun game makes it easy to dispense your own unique brand of justice.